The Journal especially encourages the submission of articles, which are empirical in nature. Theoretical work submitted to the Journal should be original in its motivation or modeling structure. Empirical analysis should be based on a theoretical framework, and should be capable of replication. It is expected that all materials required for replication (including questionnaires, computer programs and data sets) should be available upon request to the authors. It aims to act as a guide for new developments and prospects in different aspects of economic thought and business methodologies and it is published simultaneously online and on a printed form three to four times a year by the Eastern Macedonia and Thrace Institute of Technology (EMaTTech), located in Kavala, Greece. Papers are invited both from academics, researchers and practitioners. We are looking forward to welcoming your papers in our academic community. 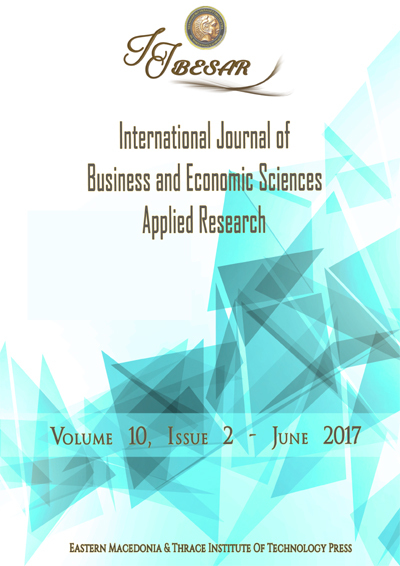 The International Journal of Business and Economic Sciences Applied Research is an open access Journal, which means that all content is freely available without charge to the user or his/her Institute. Users are allowed to read, download, copy, distribute, print, search, or link to the full texts of the articles, or use them for any other lawful purpose, without asking prior permission from the publisher or the author. This is in accordance with the BOAI definition of open access.